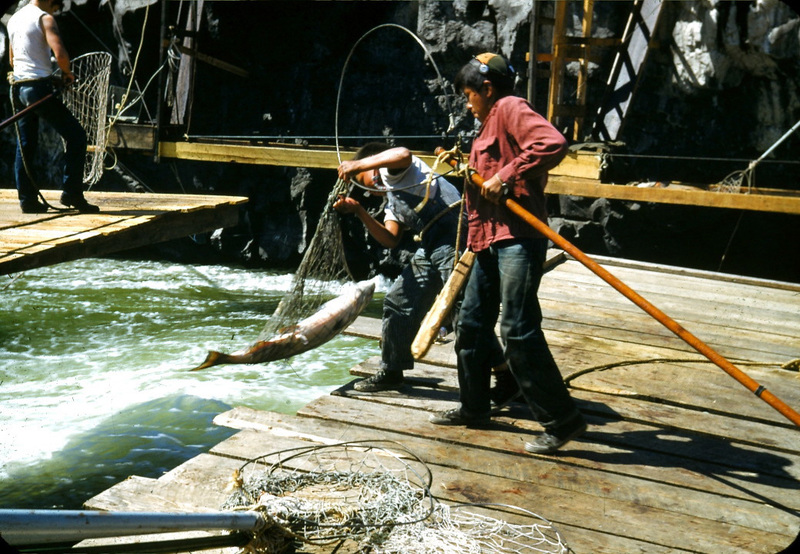 For centuries Indians caught the giant chinook and other food salmon that struggled to make their way upstream through the rocky barrier of tumbling waters and swift, narrow channels of the Columbia River known as Celilo Falls, or Wy-am. During the spring flooding, ten times more water passed over this spectacular waterfall than passes over Niagara Falls today. The ancient ones left a record of their lives in the ashes of campfires and buried sanctuaries of their dead. They left tools and weapons, items of adornment, and samples of their art. Their record of habitation proves Wy-am to be one of the longest occupied sites on the continent. For thousands of years, Wy-am was one of history’s great market places. A half-dozen tribes had permanent villages between the falls and where the city of The Dalles now stands. As many as 5,000 people would gather to trade, feast, and participate in games and religious ceremonies. Elders and chiefs regulated the fishing, permitting none until after the First Salmon ceremony. Each day, fishing started and ended at the sound of a whistle. There was no night fishing. And when a fisher was pulled into the water – most who fell perished in the roiling water – all fishing ceased for the day. In later years, each fisher was required to tie a rope around his waist, with the other end fastened to the shore. Elders and others without family members able to fish could take what they needed from the catches. Visiting tribes were given what they could transport to their homes. The rest belonged to the fishers and their families. 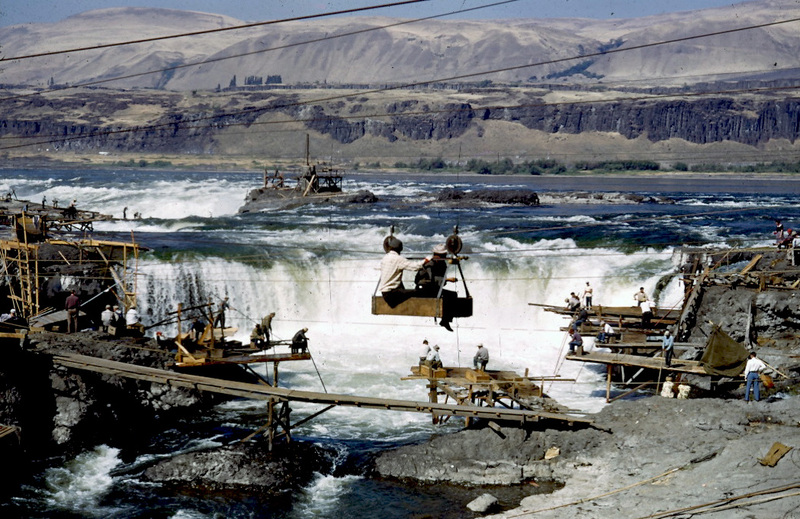 A newsreel featuring Celilo Falls that was produced in 1933. 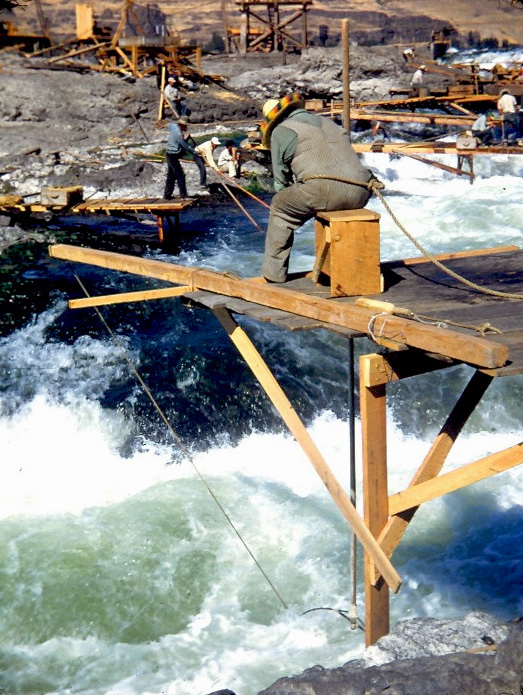 The film is titled “Rebuilding Indian Country.” It is unclear whether the background sound during this segment was recorded at Celilo Falls, but if it was, it is the only audio recording of the mighty roar of the falls that CRITFC researchers have been able to discover. 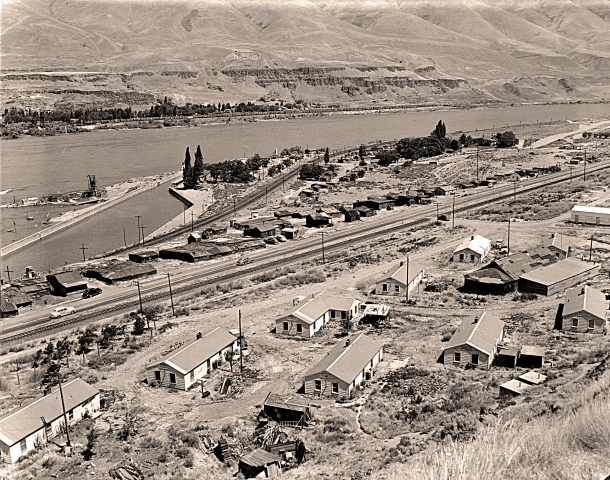 All this changed on the morning of March 10, 1957, when the massive steel and concrete gates of The Dalles Dam closed and choked back the downstream surge of the Columbia River. Four and a half hours later and eight miles upstream, Celilo Falls, the spectacular natural wonder and the age-old Indian salmon fishery associated with it was under water. That was more than 50 years ago. But the spirit of Wy-am – which some say means “echo of falling water” – still lives in the traditions and religions, indeed in the very soul of Columbia River Indian people.